10. 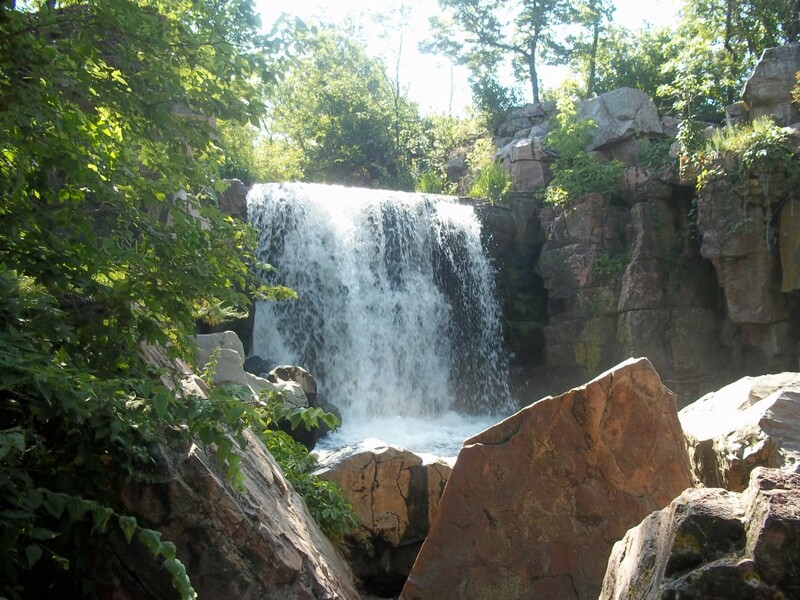 Winnewissa Falls, Pipestone – Located in the Pipestone National Monument in the southwest corner of Minnesota, Winnewissa Falls is a 20-ft waterfall surrounded by rock quarries and stray boulders. The Monument site is rich in geological history with a walking trail through the quartzite rock faces along the Pipestone Creek. It’s a welcome respite from the surrounding farmland of the area. 9. 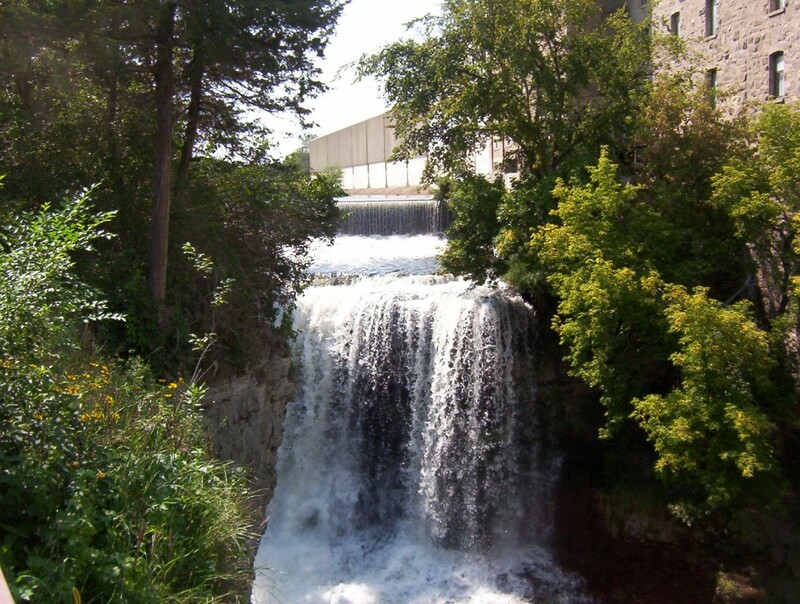 Vermillion Falls, Hastings – Vermillion Falls is right in town in Hastings, just off Highway 61 next to an old mill site. Just steps away from a parking area, there is paved trail right to the edge of the 50-foot falls. Limestone rock walls make up the gorge that the water flows into before it makes its way to the Mississippi downriver. Hastings also features dozens of historic homes and buildings and a mural of the gone-but-not-forgotten Spiral Bridge. 8. 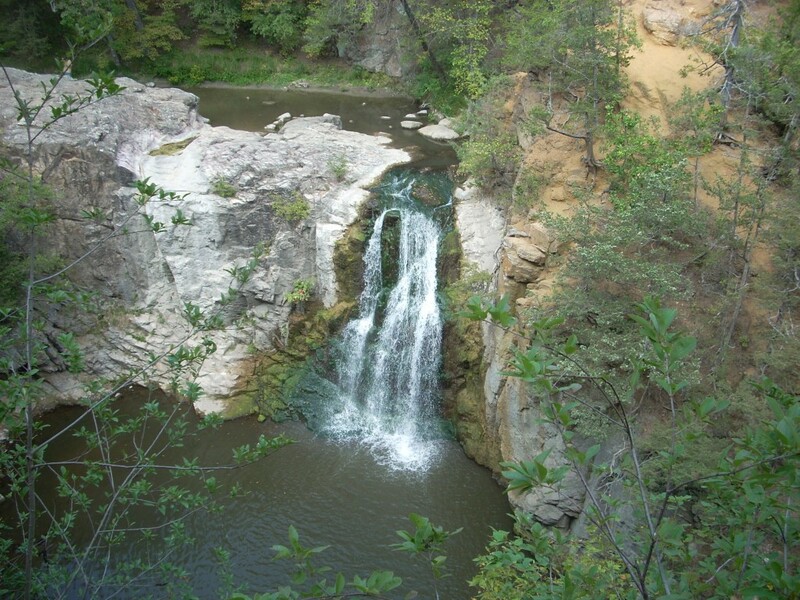 Ramsey Falls, Redwood Falls – This 45-ft tall waterfall in the Alexander Ramsey park in Redwood Falls cascades down a picturesque granite ravine in a heavily wooded bluff area. Ramsey Park is the largest municipal park in the state and is located in the Minnesota River Valley in southwestern MN. You can basically drive right up to this site and take a quick little hike to the observation area. 7. Illgen Falls, Silver Bay – The beauty of Illgen Falls is not just the fact that it’s a gorgeous little waterfall in Tettegouche State Park, it’s the fact that you can rent a cabin which is located less than 100 feet from it. The Illgen Falls Cabin is the only one of its kind; a fully-furnished A-frame that sleeps six, completely within the confines of the state park The cabin, formerly a private residence, is a drive-to, gated site which ensures the beautiful 50-ft falls is your own private little piece of paradise. 6. 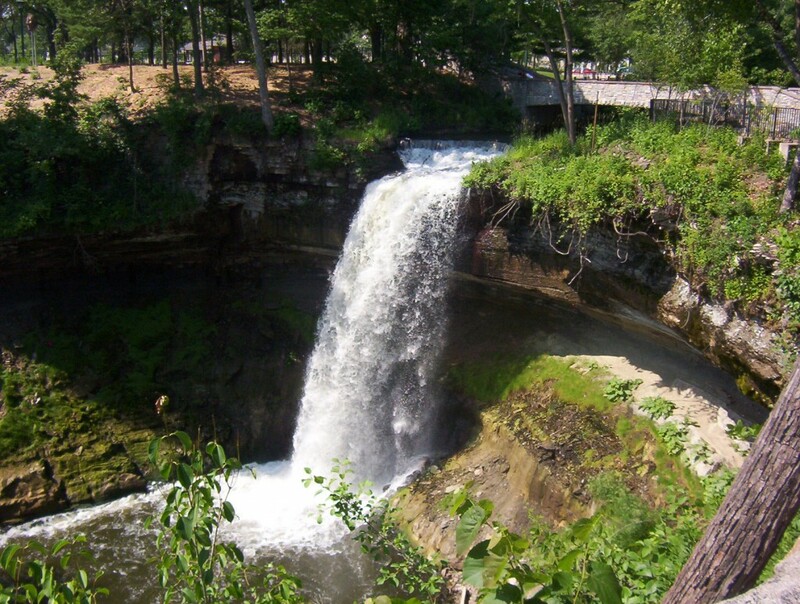 Minnehaha Falls, Minneapolis – The 53-foot waterfall in Minneapolis is a contrast from the busy city-life surrounding it. Minnehaha Creek winds its way around the metro area and drops off a rock cliff before flowing into the Mississippi River just downstream. Expect this place to be full of visitors year-round, but there is plenty of room to explore the park. It’s incredible when it freezes. 5. Wolf Creek Falls, Banning State Park – This small but secluded waterfall in Banning State Park is found deep in the woods after a bit of a hike through hardwood forests and rock outcrops. It’s a magical place, feeling more like a whimsical fairytale land than a Minnesota state park. You will rarely see others back here and the tranquility of this serene wonderland will make you never want to leave. 4. Minneopa Falls, Mankato – Minneopa Falls, found in Mankato, MN, features a small waterfall followed by a 25-foot falls into a river gorge with an arch bridge as the backdrop above the waterway. Easily found on the edge of the town of Mankato, this state park also features hikes overlooking the bluffs and an old windmill from the 1800’s. 3. Devil’s Kettle, Grand Marais – A real geological anomoly, the Devil’s Kettle has stumped just about everyone who has ever researched the damn thing. The Brule River makes its way through Judge C.R. Magney State Park on the North Shore of Lake Superior, and splits into two streams. The waterfall on the right drops fifty feet into a pool and makes its way out to the big lake. The falls on the left drop into a sinkhole and disappear to God knows where. Apparently geologists have dropped brightly colored dyes and other objects into it and have no idea where they end up. 2. 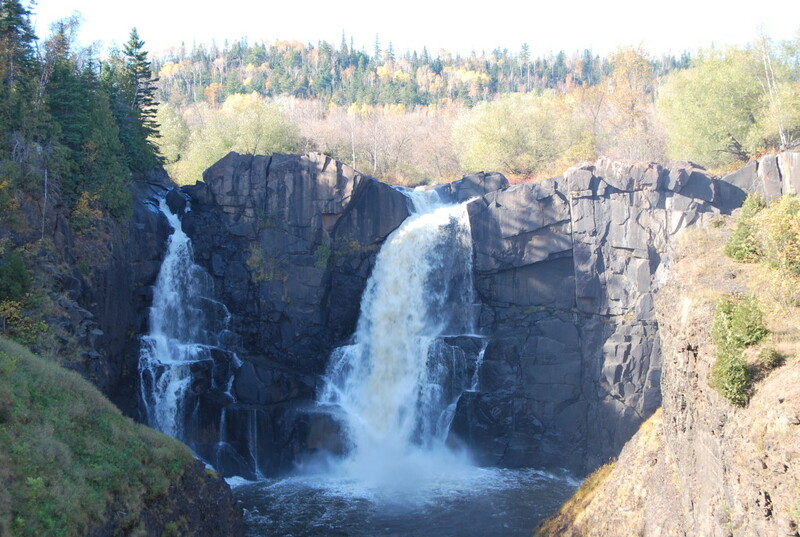 High Falls of the Pigeon River, Grand Portage, MN. The highest waterfall in the state, located in Grand Portage State Park at the far northeastern corner of the state, is a remarkable site. The Pigeon River thunders down a shale rock cliff 120 feet into a shallow pool and out to Superior. This one is way off the beaten path, but absolutely worth it. An easy 1-mile hike from the parking lot leads to an observation platform of the falls, which is also the International Border of the US and Canada. 1. Gooseberry Falls, Two Harbors, MN. The crown jewel of the North Shore, Gooseberry Falls is one of the most recognizable sites in the state. Featuring 5 sets of falls through a dramatic river gorge, the Gooseberry River flows out to an agate beach into the largest lake in the world. Hiking trails wind around the falls through pine forests and rocky cliffs. This is an absolute must for any Minnesota sight-seeing enthusiast. It’s that awesome. Honorable Mentions: The Cascades at Manitou State Park, Niagara Cave Falls, Temperance River Gorge, St. Anthony Falls, Cascade Falls at Cascade State Park, and High Falls at Tettegouche State Park. 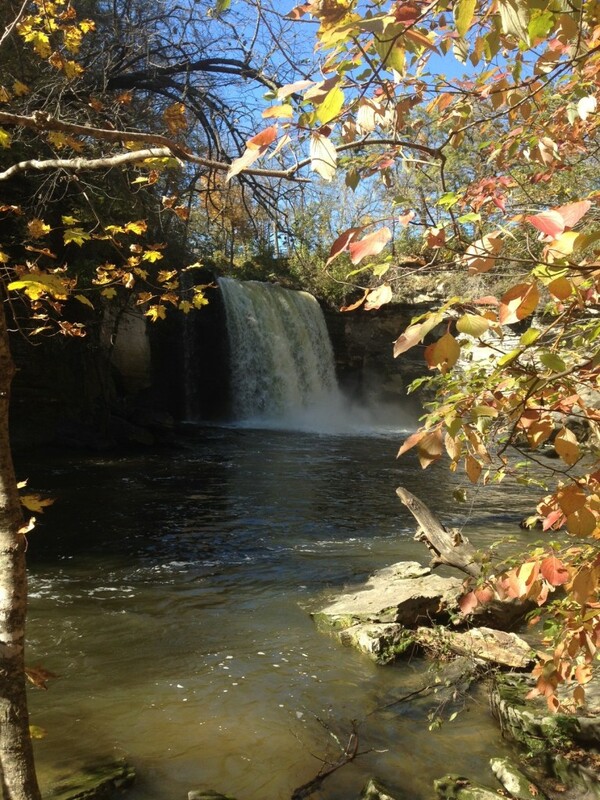 This entry was posted in Highway Highlights and tagged Minnesota Geology, MN, Top 10, Waterfall by Seth5544. Bookmark the permalink. there are only 9 listed on here, where is number 7? Oops, must have somehow overlooked that! Thanks for letting me know, it has been updated. What about Niagara Cave’s waterfall near Harmony, Minnesota? That one beats several on this list. I listed Niagara Falls in the Honorable Mentions. 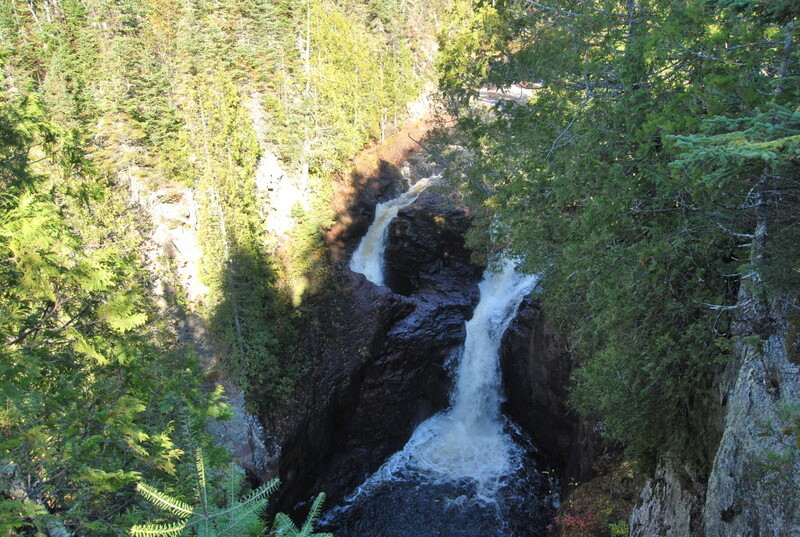 How could you leave out High Falls on the Baptism River at Tettegouche? 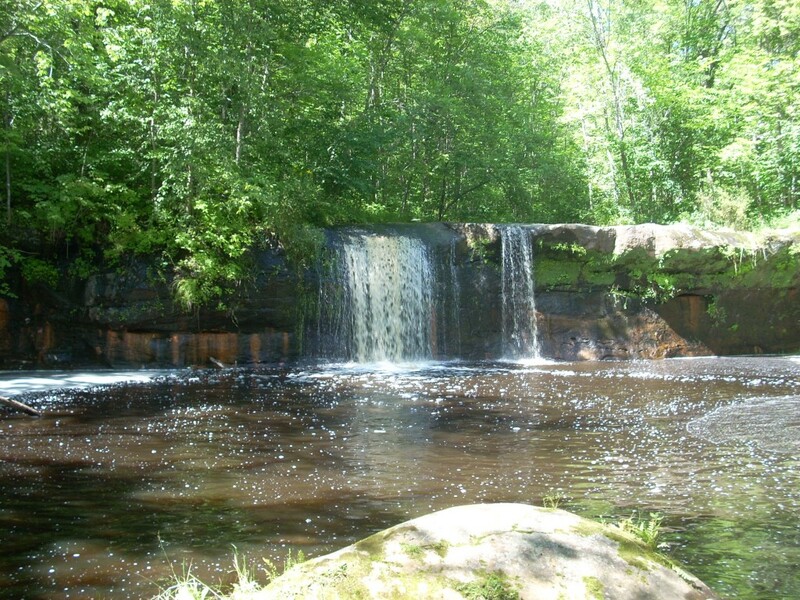 This is the highest falls in MN other than Pigeon River and is quite beautiful, especially so in moderate flow. Caribous Falls, Beaver River Falls Cross Creek Falls – all very impressive North Shore falls you left out! Personally, the non-North Shore falls you mention are all very enjoyable, but only the North Shore is the real deal. 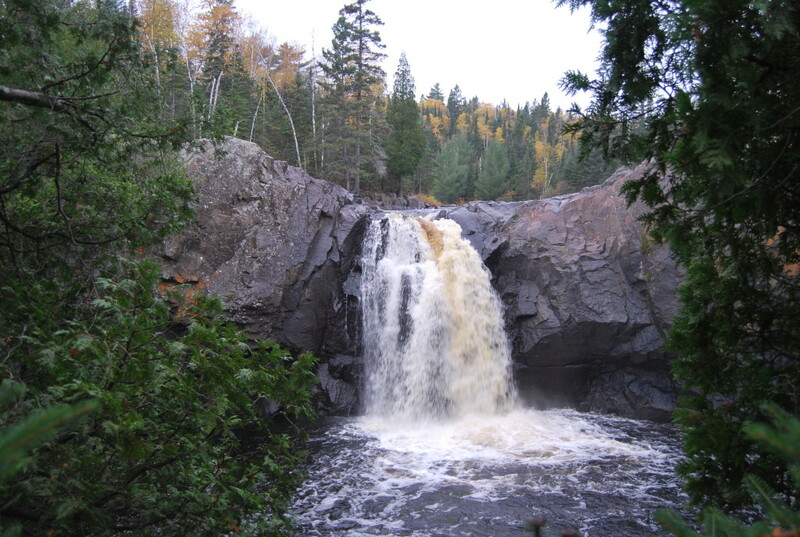 I agree with the other reader – High Falls at Tettegouche is the real deal. I could see how one might argue it is not a slam dunk at #1, but it’s pretty hard to leave it out of the top 10. And I should also mention the gorgeous series of some 9 unnamed waterfalls on the Split Rock River on the North Shore – one of the best hikes in the state!! Thanks for the list! I’ve seen some of them, but not all, and I think I will make that one of my goals for the summer. Looking forward to the rest of them! Thank you for reading! They really are all amazing in person. If I want to take my kids and enjoy some diving or swimming, which is the best water fall that I should visit? my kids are age 5-14. I live in maple grove. 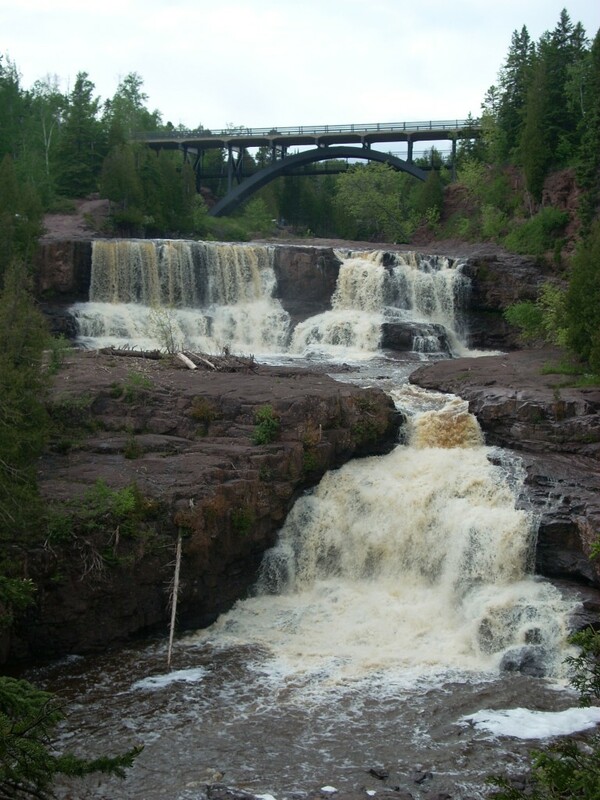 Gooseberry Falls or Illgen Falls up on the Northshore. What other ones are safe to swim in? Can you swim in the Niagra Falls? The Cascades of the Manitou River are very beautiful – quite an adventure getting there, but very rewarding.